I know many of you readers tune in only to get inspired for dinner ideas. Here's an oldie, but goodie. 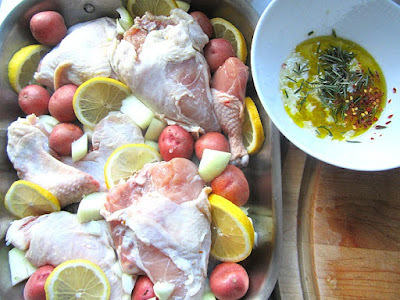 I rarely buy a whole chicken cut up, because I am one of those weirdos who LOVES breaking down a chicken herself. There is something very satisfying (for me anyway) cutting up a chicken into parts, feeling your knife go thru the proper spots as if you were a butcher. It takes practice, but I can butterfly a bird like nobody's business (but I still can't perfectly filet a fish!). Growing up, my mother used to kill the bird twice. She baked it for 2 hours at 375F until there was nothing left in your mouth but the taste of ketchup (used to help swallow the dried chicken down). You may think me mean, but I am honest. I only started buying chicken parts again, because sometimes you just want a leg. You will LOVE this simple dinner, and if you are doing Whole 30 (which I am not), feel free to sub in sweet potato chunks. Add in carrots or parsnips.......whatever you like. This is super moist and a great family meal. 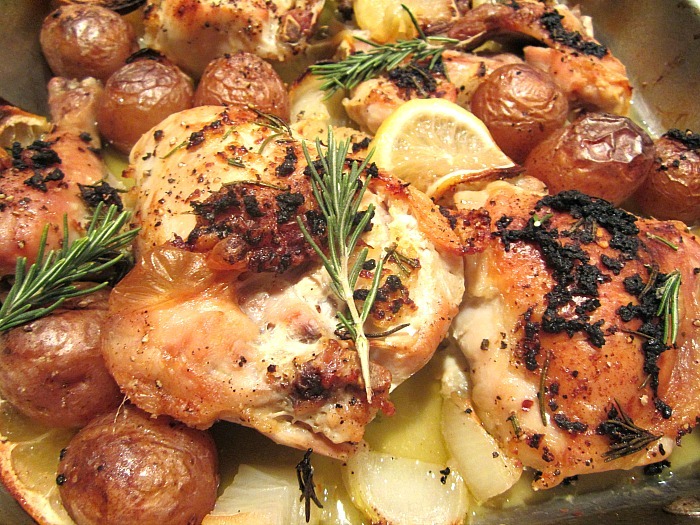 In a small bowl, mix the lemon juice, olive oil, garlic and rosemary together. 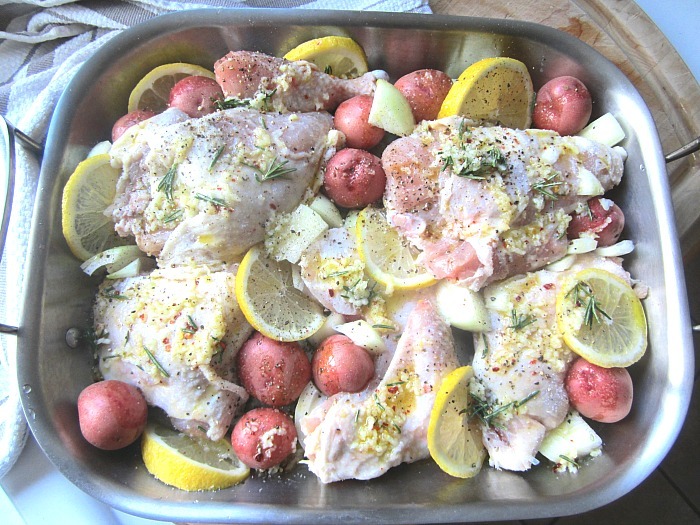 Lay the chicken with onion and potatoes in a 13 x 9 baking dish (I don't use glass because the oven temp is 400F...too hot). Pour the marinade over the ingredients in the pan. Sprinkle everything liberally with kosher salt, pepper and hot pepper flakes (I like a little heat). Bake at 400F for 1 hour, uncovered. This is a no dry chicken zone. Thanks for this. 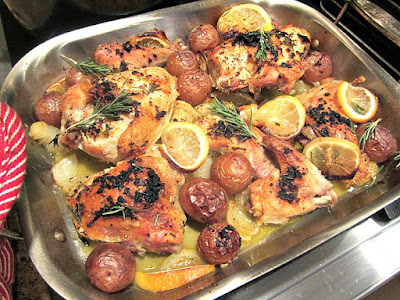 I could easily prep this dish in the morning and have my kids put it in the oven before I get home. Great recipe. I don't remember seeing this one before! Love to see your posts in my email! Always great recipes. Thanks so much! love this....i make a version of this too . I add some white wine and green olives to it soo good!